Colors and background by Nicola B. Featuring the last battle between Rollout and Charger, this cover is a tribute to the classic cover of the epic G1 Marvel US #18, "The Bridge To Nowhere!". 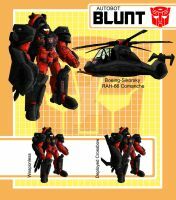 Click on the NEXT link to continue reading our 11-pages comic, that takes place between issues 78 and 79 of the original G1 US run. Find out the destiny of Rollout and Charger: will they become ActionMaster? Will they be able to find the Ultimate Protector of Cybertron, as the planet fades and dies all around them? And who really is the Keeper Of Primus? 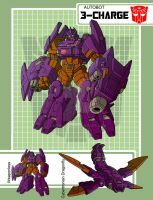 Check out the Transformers Fancomics blog for more comics of this and other fanprojects! The action in this cover art alone is a standout! 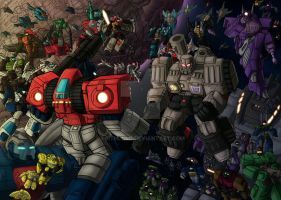 A tribute to the underrate artists who shaped the original G1 lore! Cool cool cool. Interesting reuse of my interior art for the background. And the Keeper in the corner fits very well. Awesome homage to a classic cover!